Misuse Of ADHD Drugs By Young Adults Drives Rise In ER Visits : Shots - Health News Young adults were more likely to get in trouble with Adderall and its generic form than they were Ritalin. The drugs have a reputation as helping to enhance mental performance. 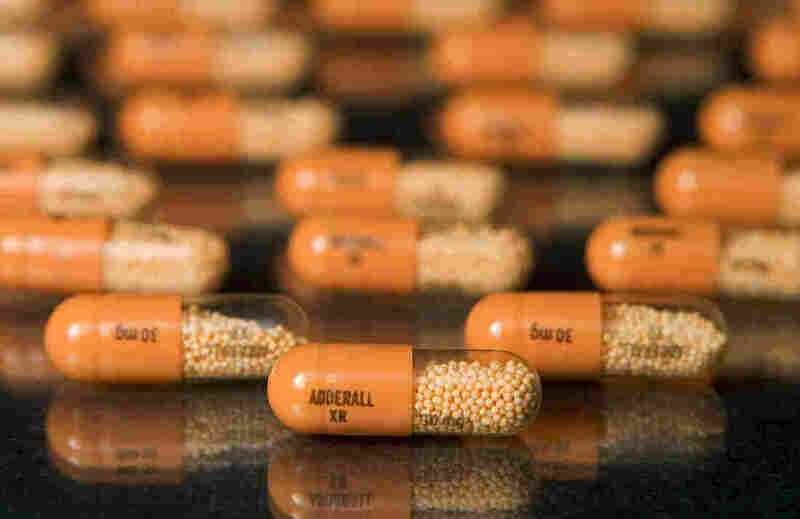 Adderall is a stimulant used to treat attention deficit hyperactivity disorder, or ADHD. It's no secret that stimulant medications such as Adderall that are prescribed to treat symptoms of attention deficit hyperactivity disorder are sometimes used as "study drugs" aimed at boosting cognitive performance. And emergency room visits linked to misuse of the drug are on the rise, according to a study published Tuesday in the Journal of Clinical Psychiatry. "Young adults in the 18- to 25-year age range are most likely to misuse these drugs," says Dr. Ramin Mojtabai, a professor at the Johns Hopkins Bloomberg School of Public Health and senior author of the study. A common scenario is this: A person who has been prescribed ADHD drugs gives or diverts pills to a friend or family member who may be looking for a mental boost, perhaps to cram for a final or prepare a report. And guess what? This is illegal. Overall, the study found that nonmedical use of Adderall and generic versions of the drug increased by 67 percent among adults between 2006 and 2011. The findings are based on data from the National Survey on Drug Use and Health. The number of emergency room visits involving Adderall misuse increased from 862 visits in 2006 to 1,489 in 2011 according to data from the Drug Abuse Warning Network. The most problems include anxiety, agitation and insomnia. But Mojtabai points out that stimulant drugs are also associated with cardiovascular side effects including increased blood pressure, and in very rare events heart attack and stroke. It's worth noting that ER visits linked to Ritalin, another well-known stimulant used to treat ADHD, increased only slightly among young adults, from 293 ER visits in 2006 to 310 in 2011. And nonmedical use of Ritalin remained much lower than misuse of Adderall. "Adderall has gotten a reputation ... as a cognitive enhancer," says Mojtabai, and that "may have contributed to this increased trend of misuse." The authors point to another factor, too. "The extended-release formulation of [Adderall] has a longer duration of action than [Ritalin], producing a more steady effect," the authors write in the manuscript of the study. Doctors groups have railed against using stimulant drugs to enhance mental performance. But it seems some potential users haven't gotten the message. A prior study found that college students have several justifications for their illegal use of ADHD stimulant medications, including the belief that it could improve their smarts. The study also found students were not knowledgeable about the side effects. "We discovered that these students frame stimulant use as both physically harmless and morally acceptable," wrote the authors.